This a capella album is not like many Sefirah albums that have come out in the past few years. There is no fake music or computerized voices. (Yes, those do sound more like ‘music’, and are therefore more enjoyable to most. However…well, that’s another story.) This album is more like the Lev Tahor a capella albums. (See: MusicBochur’s Guide to Jewish A Capella. I hope to have it up sometime soon.) Each song has its own original intro, sung in beautiful harmony by the choir. Additionally, each song features a different ‘celebrity’ soloist. I particularly enjoyed how they fit each soloists unique style of ‘shtick’, or trills, into their respective songs. As a whole, this album is a very pleasant listen, with nice harmonies and a very good song selection. 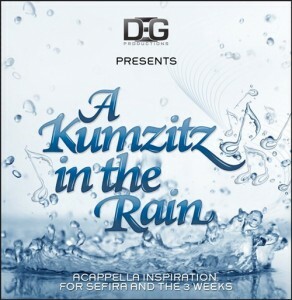 A Kumzitz in the Rain was arranged and produced by Doni Gross of DEG Studios. Track #1- Shalom Aleichem (? ):The album starts off nicely with a Shalom Aleichem. Although it does sound somewhat familiar, I still have yet to identify the origin of this song (meaning the tune, not the words). I’m pretty sure the soloist in this song is (Elie?) Scharf, from Schwebel, Scharf & Levine, but I’m not sure. Regardless, he does a very nice job on this song and it was a pleasure to listen to. Track #2- Hinei Ma Tov (Shalsheles): Hinei was the first song on the fourth Shalsheles album. Originally featuring Shalsheles Jr., this song caught on pretty well a few years ago. This version features Rivie Schwebel, whose unique voice adds quite a bit. Kudos to the arranger who very nicely fused the intro within the song (similar to how Lev Tahor fused their intro to the D’veykus Lakol Z’man into their rendition of that song). Track #3- Acheinu (Lev Tahor): You may have heard this song before. But that’s probably only if you listened to the entire Lev Tahor album on which it was first sung. For some reason, this song never quite got its ’15 minutes’. Featuring Shloime Dachs, as well as a child soloist who I have yet to identify, (it may be his son, Dovid, but I think it sounds more like Avrumi Schwebel,) this song may finally catch on. Nice ‘shtick’ by Shloime on the last high part, and great harmony by the ending. Track #4- K’ayol (Dedi on JEP): Fair warning- I’m biased. I already REALLY liked this song before this album. Most people have heard this song, as almost every camp has used this tune as an alma mater at some point over the years. Featuring Ari Goldwag, who added his own filler before the transpose (I’m assuming that was of his own creation), this song is rapidly shooting its way up my Most Played list. (It does help that there’s not much else to listen to these days.) Great song. Track #5- Ahavas Yisroel (Marvelous Middos Machine, Yeedle, Every Tisha B’av Cantata For the Past 20 Years): I’m not a huge fan of boys choirs singing English songs; there are few I’ve enjoyed since the old Miami classics. However, the kids do do a nice job with this song. The voice(s) I’ve recognized belong(s) to Dovid Dachs and/ or a different kid from the new Shalsheles Jr. It feels a little shleppy to me, but that’s probably because there’s no music. Nice harmony on the high part, at the end. Track #6- Ani Ma’amin (She’arim):Ani Ma’amin originally was sung on the little known album, She’arim. It’s a nice song, although it too sounds a bit shleppy without the musical flow that I’m used to. I haven’t been able to put a name to the voice of the child soloist, even though I’m sure I’ve heard him before. Perhaps Avrumi Schwebel? There is also an adult soloist, who I think is one of the original soloists from She’arim. Unfortunately, I do not know his name either. Track #7- Min Hameitzar (D’veykus): This song originally was on the sixth D’veykus album. It’s a slow but nice song. I’m pretty sure that the soloist is Yitzchak Yenowitz, who also sings on the first two V’havienu albums. Very nice voice, and this song works well for him; I’ve heard he used to sing this song quite nicely in Camp Rayim years ago. Track #8- Pia Pascha (Mendy Wald): Of all the songs on this album, Pia Pascha is the only one that comes close to K’ayol in terms of ‘classic’. Originally on Mendy Wald’s Sameach album, this song has been famous for as long as I can remember. This edition features Dovid Stein, and is a pleasure to listen to. Track #9- Kah Ribon (Ari Goldwag): Another well-known song, Ari Goldwag’s Kah Ribon is a very popular tune for both the zemer, and L’cha Dodi in Shul. I’m pretty sure that this is the first Goldwag song I ever heard; ‘coincidentally’, I’m a pretty big fan of his Lishuascha Kivisi and Simcha B’libi albums. The choir does a very good job with this song, as does the soloist (whose name I don’t know). Enjoy. Track #10- Kumzitz in the Rain: The final track is the only one that has rain in the background (as well as thunder). Beginning with the She’arim Ani Ma’amin, and flowing through the high part of both the classic Ani Ma’amin and the JEP one, this track features all of the guest soloists as they each sing another line of the song. The transitions as they slide from song to song are smooth, and this track is a nice finish to the album. All-in-all, I found this to be an enjoyable album. It’s not too rocked up or ‘pumping’; those who feel that Jewish a capella should be somber or ‘toned down’ have nothing to worry about. This album is particularly good for listening to while relaxing at the end of a long day. I would assume that if one is allowed to listen to this during sefirah and the Three Weeks, it is also permitted to go to sleep while listening to this. (I advise consulting with your Rav or Posek before doing so.) I also like the fact that, while all of the songs are nice, the producer did not take only classics; rather he chose songs that are not well known by all (nor do they already have 12 different versions). The choir was arranged very well, and the harmonies are superb. Enjoy! !